If you know a deserving family that is inspirational to you, despite their circumstances, then please share their story. 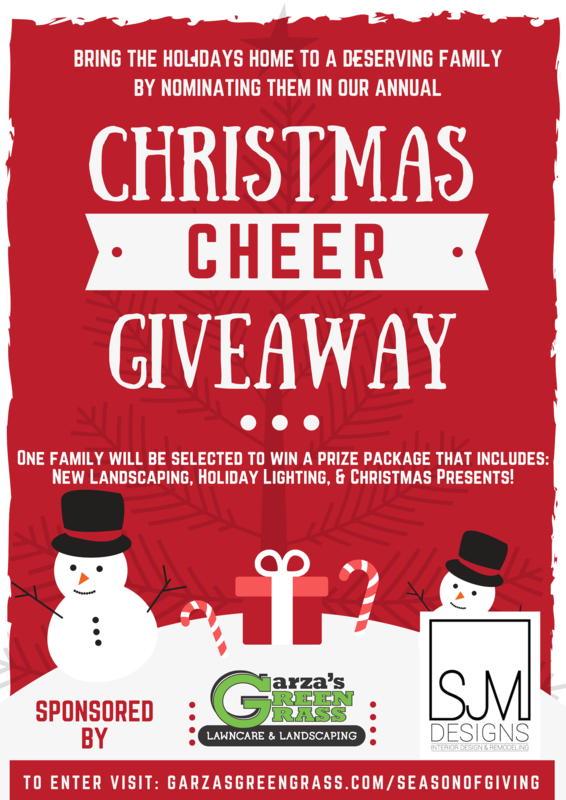 We will pick a family and award them a prize package bringing the holidays home to them that includes new landscaping (designed, delivered, and installed), Christmas lights installed on their home, and plenty of Christmas presents to go under their tree. Please share a story with us of a family who might need a little extra help this holiday. Together, with our sponsors, we will help make this a heartwarming holiday. ***Contest Period: All entries must be received by 11:59pm on Sunday, December 2, 2018. Winner Announcement: Winner will be announced Monday, December 3, 2018. Delivery of Prize: Prize package will be delivered upon coordinating with winner. Winner must be 18 years or older, a resident and homeowner within Garza’s Green Grass service area (including the Oklahoma City Metropolitan and Surrounding Areas and Lawton and Surrounding Areas). One entrant will be selected during the Contest Period. If it is determined that the winning candidate(s) is (are) not eligible to receive the prize, in our sole judgment and discretion, another candidate will be selected for eligibility consultation. All prizes are awarded “as is.” Prizes are nontransferable and cannot be exchanged. No substitute prize will be awarded to a winner who declines to accept a prize. Prize package includes the following: Christmas lighting for the exterior of the winner’s home including delivery, installation, and removal at the end of the season. Design at sole discretion of Sponsors. New landscaping for the home – winner to be consulted during the design process. Location, plants, and materials chosen at sole discretion of Garza’s Green Grass Lawncare & Landscaping. Labor for landscaping will be provided by SJM Designs employees and Garza’s Green Grass Lawncare & Landscaping. Christmas Presents will be chosen from a “wish list” provided by winner that allows for several options to ensure sponsors remain within prize budget. No purchase is necessary to win. From time-to-time our site requests information via contests. Participation in these contests is completely voluntary and you may choose whether or not to participate and therefore disclose this information. Information requested may include contact information (such as name and shipping address), and demographic information (such as zip code, age level). Contact information will be used to notify the winners and award prizes. We will not use or sell your information for any other purpose than this unless you inquire about our services.